(PhysOrg.com) -- At the European Geosciences Union (EGU) meeting last week, lead researcher Rinus Wortel from the University of Utrecht presented the findings that Europe is slowly moving under Africa, creating a new subduction zone. 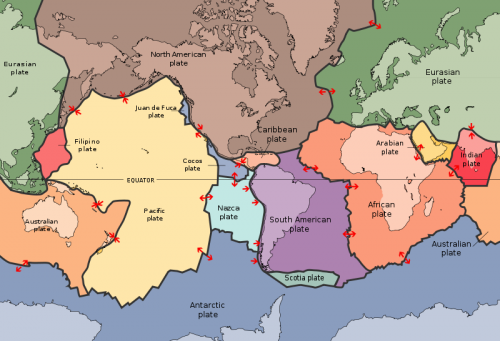 For many millions of years, the two continents have been converging with the northern edge of the African tectonic plate slowly descending underneath the Eurasian plate. However, Wortels research has showed that this process seems to have stalled and may be in the process of changing roles. While the dense rock of the northern African plate has been drawn into the Earths mantle, the remaining portion of the African land mass is too light. With this being the case, Wortel points to the possible reversal of roles, seeing the heavier Eurasian plate now moving below the African plate and creating a new subduction zone. With this possible switch in roles, scientists are warning of an increased risk of seismic activity in the Mediterranean. Because of this, and in light of the recent earthquakes and tsunamis in Japan, scientists are voicing concern that European countries are not putting enough resources into a tsunami warning system. While earthquakes in the Mediterranean region are traditionally smaller than those found in the Pacific Rim, there have been recorded magnitude 8 earthquakes. Researchers are hopeful that this confirmation of a European subduction will lead the way to allow scientists to better model the region and assess the risks of earthquake and tsunami activity in the area. So......in a way......Glenn Beck was right? rgwalther, the sad thing is there are people who still think McCarthy was justified and even sadder, some who still think he was right. There is no convincing the paranoid. Maybe one day we'll have a pill for it. I've already created a pill for it. It's 2 inches in diameter and whoever swallows it chokes to death. 2) The allies faced a real danger in Korea and needed to commit themselves, which they belatedly did. I suppose it was also proper to quash the hysteria he generated, but that does not mean he was wrong. And his efforts produced public support for the Korean war, by presenting the prospect of an enemy in our midst who was invading our allies abroad. Starry-eyed idealists 1-rate me because I state the whole truth. Is your ideology so important that it takes precedent over facts? Apparently. WHAT IS IS. Why cant THAT be your ideology? Why cant the WHOLE truth be what you believe in, what you stand for? Why dont you go back and re-educate yourselves about mccarthy and the cold war, you know scrape off the gummy propaganda you fell for and see if you can make some sense of it? That is if youre not too lazy or too comfy in your little dreamworld. This is the best long term solution and news I've heard in a long time. My hope it take all the progressive and socialist EU ideas and people with it. Only one problem what the hell to do with that basket case continent Africa, well it can't be any worse than the EU! And please care to explain how a young continent like america knows any better than its parent that has developed a modern society for much longer? But hey dont worry, your corrupt capitalist tentacles are starting to find its way into europe and asia, happy? And care to explain how the living standard is much higher in europe than it is in the USA? Ooh wait maybe modern socialism is actually good for the poeple of the country. Maybe it is good to have an ideology for improving living on earth. How else would you be using your computer if it wasnt for pregessive mindsets? TheGhostofOtto1923 describes himself pretty well. Too bad he doesn't realize it. Continental plates cannot subduct as the continents themselves are too light. Once the land masses lock together any subduction ceases. So where is this new subduction zone supposed to occur? Uh who you talking to frank? Your navel? I know this is in bad taste, but I can't help myself. Does anyone else find it ironic that there is a large number of people fleeing Africa to Europe (see http://www.physor...s.html), and perhaps one day the European continent will be under Africa? I know the time span is extremely large for geological events compared to human life, but I just found this amusing. Look up Human Development Index on wiki if you like. It is the United Nations anual rating system. The numbers for 2010 are available already. I have a little trouble with the way they do it though. Lumping all of the US into one big bucket is a little deceptive. It's a big country. Another thing that stands out to me is the big jump between the relatively good places and the others. The difference between the US, Canada, Australia, and the EU is very small and could even be subject to some random data noise. Then you have the next step down, like Mexico, Portugal and Lybia. There's a BIG difference between Norway and Lybia. I would say that the differences between the EU and the US are so small as to be inconsequential. Boasting about how one is better than the other is silly. At least neither of us is India. If you live in a country where you have the time and money to sit around bitching about liberal versus conservative politics on the internet, then you do not have anything to really worry about. When there's no more Europe, when the last tiny bit of it slides under, where do you think all those Europeans will go? I'm sure glad there's a nice big ocean between them and US!! Enjoy your new neighbors. By the way, if California goes down, would you be intersted in taking a few of them too? We'll pay for the transportation!